All types of people fantasize about taking a trip by car across the country or to a faraway vacation destination. Road trips are a lovely way to spend time with family, while saving money on a plane ticket and enjoying the scenery as it passes. But, as exciting as the idea of a road trip may be, the fact of the matter is that everyone is going to spend many hours sitting down in one place. The ride will be even more tiresome to the driver, who will likely be driving in one direction without any traffic lights. Just because you’re traveling by car doesn’t mean that you’re necessarily confined to that space. In fact, there are many things that travelers can do to interrupt the monotony of the drive. 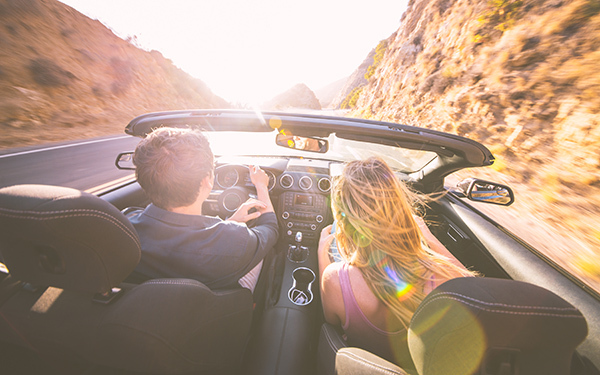 The experts at CarRegistrationAdvisors.org have created a short list of things to do to make a road trip even more fun for everyone. Ever hear that it’s not about the destination, but the journey it took to get there? One of the greatest appeals of road trips is that travelers are able to stop to explore at any time, unlike on a train, on a bus or on an airplane. Although a significant part of road trips will likely be spent on a concrete highway with limited scenery, travelers can take short detours through different cities and towns. The beauty of road trips is that travelers have the opportunities to experience cities that may be much different from their home towns. Depending on the city, there are so many new, exciting things to experience, like historical monuments and museums, regional festivals, local food and so much more. Another advantage of being on a road trip is that the itinerary is completely up to the travelers. Travelers can choose to stay in a town for a few hours or for a few days, if they’d like. When passing through culturally rich cities, the team at CarRegistrationAdvisors.org suggests staying in hotels, especially historical or family-owned hotels. This gives travelers a better opportunity to be fully immersed in the culture of that city. Rest stops are a great place to use the bathroom, refill on car fuel and get snacks. Travelers also get a chance to stretch their legs and recharge. Some rest stops that are located outside of popular cities may carry brochures about tourist attractions. Before the road trip and at every rest stop, the team at CarRegistrationAdvisors.org strongly recommends inspecting the travel vehicle. Because the car is traveling such a long distance, it’s important to make sure that everything is working correctly, and that the tires haven’t been damaged by anything on the road. Plenty of rest stops have a small-car, 24-hour servicing area with mechanics who are able to work quickly and efficiently for people on-the-go. If possible, it’s best to go on road trips with more than one traveler who is able to drive. Some road trips may take several days to get to the destination, so switching drivers allows the previous driver to rest and sleep before driving again. Switching drivers makes the road trip experience more fun for everyone, because everyone gets a chance to relax and enjoy the ride. At CarRegistrationAdvisors.org, our team strongly discourages one person driving for more than 10 hours at a time, especially if the driver has worked a full shift or did anything physically draining prior. If a driver ever feels like he or she may fall asleep at the wheel, pull over immediately and switch drivers. If there are no other drivers, pull over until the driver feels able to safely drive again.